Does your flat chessboard have you longing for more? 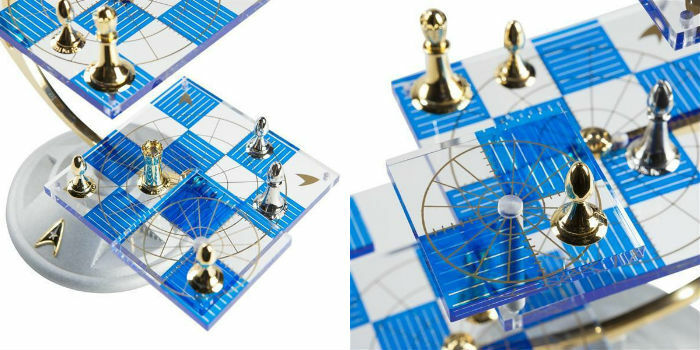 Reach for the stars with one of these cool 3D chess sets! If you’ve mastered the game of chess in two dimensions already, or you’re just ready for a little change of pace, a 3D chess board could be just the thing you’re looking for. 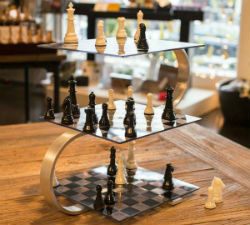 The 3 dimensional chess boards on this list add a whole new dimension to the game of chess – literally! If you’re looking for a 3D chess board with the same rules as chess, you may want to start with the 3D Battle Chess Sets Series. That set is played in the same way as regular chess, just across a 3D platform. It may take a few tries to get your head around the differently shaped board, but it will all make sense in time, and you won’t have to learn the rules of an entirely new game. The other two sets, on the other hand, play by their own rules. 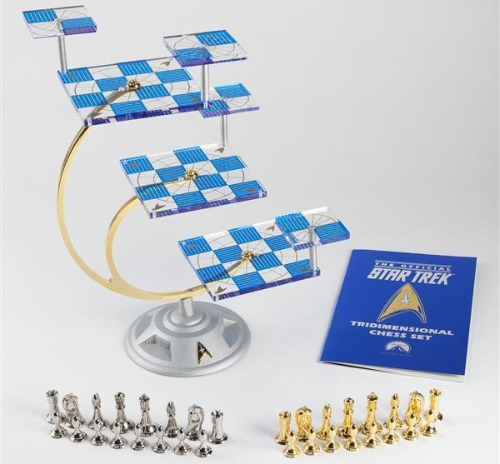 The Star Trek 3D Chess Set has rules of play based loosely on a futuristic game featured in the Star Trek TV series and movies. The Strato 3D Chess Board has yet another set of rules to learn. If you’re up for a challenge, buy all three sets, and you’ll always have a new three dimensional chess game to play once you get tired of the old one! The 3D Battle Chess Sets Series is a great line of products for people who are looking to add an extra element of fantasy to their chess games. Unlike some of the other three dimensional chess sets on this list, the playing surface is all on one level, like a traditional chess board. What makes these sets 3 dimensional is the way that the playing surface is suspended above an intricate metal battleground. The exact details of that battleground vary depending on which item in The 3D Battle Chess Sets Series that you choose. 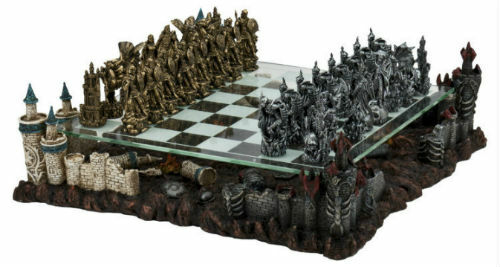 For example, The Medieval Knights 3D Chess Set and The 3D Fantasy Chess Set both feature a mountainous scene littered with the shields and swords of fallen knights. Four turrets of ruined castles lie at each of the four corners and support the floating glass chessboard, where the remaining Knights still do battle against each other, locked in eternal conflict – until you finish your chess game, that is. The Roman Gladiators 3D Chess Set features Gladiators, horses, lions, and members of the Roman elite vying for survival on a chessboard suspended over a pewter model of the Colosseum. When you play a game on this set, you can almost hear the cheering and jeering of the crowd as you ruthlessly take out your opponent’s pieces! 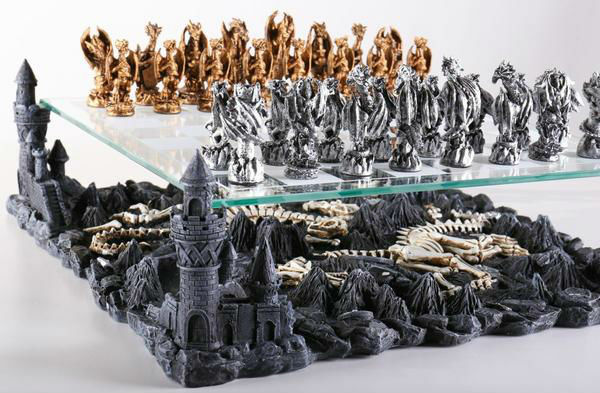 The 3D Dragon Chess Set is the ultimate in fantasy themed 3D chess sets. It features a wide variety of gold and silver dragons doing battle in the air above an ancient dragon battlefield, where the skeletons of two enormous dragons still lay. The detail on the pieces and board in this set almost makes you believe that dragons are real! 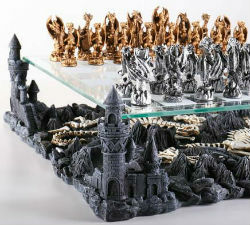 The 3D Dragon Chess Set is the ultimate in fantasy themed 3D chess sets. No matter which 3D Battle Chess Board you choose, you can rest assured that you’ll be receiving a high quality, beautiful product that will last for years and years to come. Who knows, this may even be something that you pass down in your family for generations! The pewter and glass construction of the board will remain pristine no matter how much use it gets, and the metal chess pieces themselves will only grow more beautiful with time. The Strato 3D Chess board is another beautiful and unique set with its own set of game play rules. 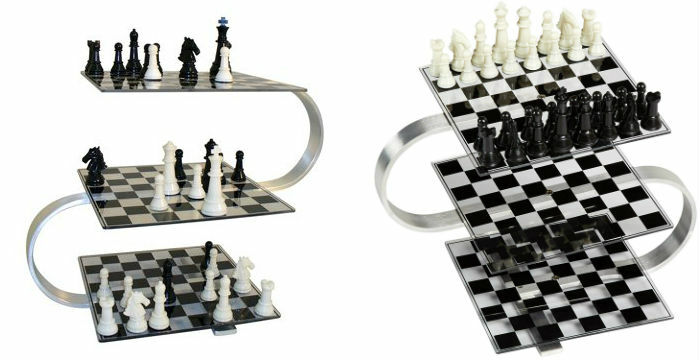 This set features a more compact design, with all 3 chess boards suspended over top of one another. Still, being a foot tall when fully assembled, this board is quite an attention grabber, and its high quality materials and elegant design make it a thing of beauty well suited to any modern home or office. The Strato 3D Chess Board features three 8-inch square acrylic boards that are suspended on three separate levels by a beautifully curved, brushed aluminum S frame. The set also includes weighted chess pieces made from durable plastic that’s certain to survive an accidental fall from even the highest levels of the board. The King piece is 2 ¾ inches tall, which is large enough to command this towering chessboard, but small enough to be manageable and fit well into almost any chess storage box. Strato chess has its own set of rules to follow which may take a bit of getting used to, but if you stick to the instructions included with this tri dimensional chess board, you’ll be fine. The main differences in rules are, of course, to account for the differences in movement over a 3D board. The main thing that you’ll need to get the hang of with this set is how to move from one board to another across the 3 different levels. Once you get the hang of that, it plays a lot like regular chess. 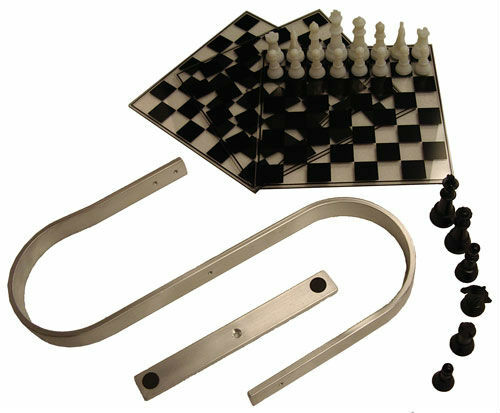 If you want to inject a bit more challenge into it, however, there are many chess variants out there that are compatible with this unique three dimensional chess board. If you like, look up the rules for variants like Parallel Worlds Chess, Millenium Chess, 3D Hook-Move Chess, Alice Chess, or Dragonchess and give them a try! This 3D chess board is made with beautiful, high quality materials that will stand up well to constant use. And it’s got a shockingly low price tag, making this set an incredible value for the money. It’s a great base for any 3D chess variant you may want to play. The Star Trek 3D Chess Set is a unique chess set that was born out of fan’s love and dedication both to the game of chess and to the Star Trek series. 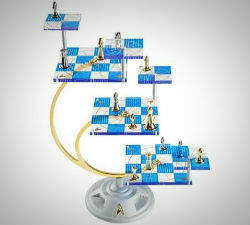 The original Star Trek 3D Chess board was first seen in the very first episode of Star Trek which aired back in 1966. It was called Tri-dimensional chess or Tri-D Chess by the characters, and at that time, the three-dimentional chess board used on screen was very much a prop and nothing more. It was constructed using various boards from 3D checkers and Tic-Tac-Toe sets which were being sold in stores at that time, along with a set of futuristic chess pieces designed by Peter Ganine. The current version of The Star Trek 3D Chess Set is far more luxurious, made with sterling silver and 24 karat gold rather than cardboard! The TV prop retained all 64 squares present on a traditional chessboard, but little thought went into the rules of play. In fact, one can see throughout the series that the sets aren’t always set up in the same way! It took the sustained efforts of one dedicated fan, Andrew Bartmess, to actually make the game playable. Those rules have evolved over time and have now been developed into the final version that comes in a collectible rulebook included with the Star Trek 3D chess set. It describes in great detail how and when to use the movable attack boards, how each piece may move, and how the boards are set up. The booklet also covers a brief history of the game and its impact on pop culture. Rest assured, all your questions will be answered by the highly informative booklet that comes with this set! When correctly assembled, this tri dimensional chess board stands 14 inches tall. With its glossy acrylic boards suspended on swooping, gold and silver plated supports, it’s quite a sight to see. It will definitely be a conversation starter for anyone who comes into your home or office, and doubly so if they’re a Star Trek fan! Who knew that 3D chess boards came in such a wide variety of styles? There are many that don’t even follow the rules of normal chess, preferring instead to make up their own variations! With such a large selection to choose from, it can be difficult for the average consumer to decide which three dimensional chess board would be the best choice for them. That’s why we’ve put together a few tips to help you choose. If you have any sort of monetary constraints at all, we recommend deciding on your budget as the first step, before you start any shopping at all. Not only will the budget you decide on help to narrow down the number of tri-dimensional chess boards you need to choose from, it will also keep you from setting your heart on something that’s well outside of your price range! Of course, if money is no object for you, feel free to disregard this step and skip straight to the next one. A unique aspect of buying 3D chess boards that you don’t have to worry about when buying almost any other type of chess board is whether the board you choose will work with the standard rules of chess. You’ll need to be aware of this before you begin and decide whether or not you’re open to learning a new set of rules to play with your 3D chess board. 3D chess boards come in a wide variety of themes, and for many people, the choice of themes is one of the easiest ones to make. Just follow your interests on this one. Are you a Roman history buff? The 3D Roman Gladiators chess set would be perfect for you. Do you love Medieval Knights? The 3D Fantasy chess set or the Medieval Knights 3D chess set would be great. Dragon lovers and Trekkies also have an easy choice when it comes to three dimensional chess sets. If you’re not drawn to any of those themes, or you just prefer the sleek look of a non-themed 3D chess board, the Strato 3D chess board is just the thing for you. Those three tips will help you narrow down our selection of the best 3 dimensional chess boards to the one that’s just perfect for you or your gift recipient. Following our method, you’ll be reaching new heights on your new 3D chess board in no time at all!